Frequently we have been asked if it might be possible to make some sort of Remedy Maker that might be small enough to fit in the pocket, and yet have all the functions necessary to originate Homeopathic Potencies. After searching in vain for suitable components that might be small enough to make such an item, we had pretty much given up until we hit on the idea of making it "Voice Programmed". The essential feature of any full function Radionic Potentiser or Remedy maker is to have some means of inputting Remedy information. This is frequently done by inputting "Rates" using a series of rotary dials calibrated 0 - 10. Alternatively something like a Databank can be used if modified for the purpose. The main problem with these solutions is that any device which incorporates these techniques cannot be made small enough to fit in the pocket. The Voice Programmed Remedy Maker that we have designed gets over this difficulty. Measuring only 130mm x 65mm x 25mm, and weighing 106 grams, the device is fitted with a special kind of microphone which converts speech into subtle vibrations. These are then stored in a temporary memory inside the device, and then amplified and fed to a tiny "Well" that is fitted in the instrument, in which the bottle of blank unpotentised tablets are placed. If required more bottles of tablets can be placed in the well and potentised simply by again operating this switch, or if required a lead can be plugged into an output socket on the side of the device to feed remedies to a larger receptacle, ( such as a metal baking dish) so that you can potentise a large amount of a substance all in one go. Then the temporary memory can be cleared by operating another small switch on the side of the device so that another remedy can be inputted. The Remedy also incorporates an "Automatic Lock" facility. Each time a remedy is made, the vibrations are immediately automatically locked into the carrier material, so that they cannot fade even if the tablets are then touched by the hand, dropped on the floor, or stored next to stong smelling sustances. This technique of locking the vibrations into the carrier is a result of work pioneered by White Mountain, and to our knowledge no other company offers devices that incorporate this facility. Remedies can even be made and given to patients, or oneself, even if no blank tablets are available, simply by placing a finger in the metal well on the device, operating the Make switch and transferring the vibrations directly into the body. This makes the device ideal to use as an emergancy first aid device, for example it could be used to make Apis Mellifica, which is a powerful Bee Sting Treatment, or one could give a dose of Malaria Officinalis, which is considered by many to be useful in Malaria prevention. Another useful feature of the device is the ability to make multiple remedies. You can record Remedy and Potency information about one remedy, then do the same thing again with another Remedy, and again until you have stored as many remedies as you require to make up your remedy combination, which can have each different "ingredient" with a different potency. Then the tablets are potentised exactly as previously described. 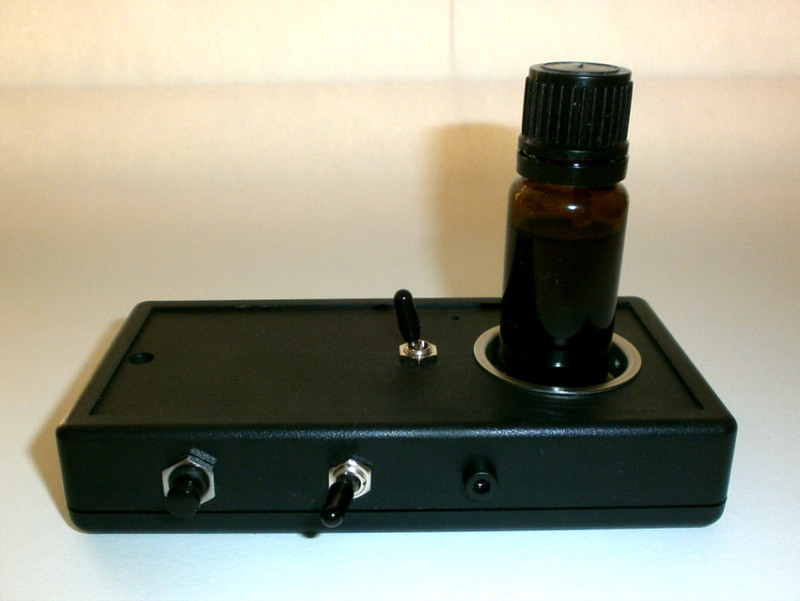 The special beauty of this device is that within seconds you can be making vibrational remedies from literally anything you can think of, Homeopathic materials or Rates, Gemstones, Colours, Flower Remedies, Frequencies, Herbs, or even the illness itself. "My Throat problem", for example, or "The pain in my leg" etc. The device is supplied with an output lead and clip so that remedies can be fed to larger receptacles, and two Lithium coin cell batteries which have a ten year lifespan. We also of course supply full instructions. 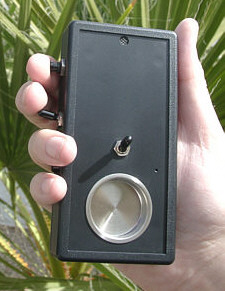 This special version of the Voice Programmed Remedy Maker looks identical to the standard version but it is fitted with a different output switch and modified circuitry that enables remedies to be remotely and continuously transmitted to patients in one position of the switch, or in the other position remedies can be made exactly the same as in the standard version. The remote transmission is acheived by placing a hair sample from the patient in the little well of the device once the remedy vibrations have been created, and then the output switch is set on continuous. In addition extra length output leads can be supplied to connect to hand holds or acupuncture needles as required, please ask for details. Have extra Remedy Copying Facilities for your Voice Programmed Remedy Maker with a Proximity Copier. The device can produce any X to LM Potency. However it will not make very good low potencies such as 1X, 2X, 3X etc as this is a device that makes vibrational remedies, and those low potencies if made by dilution would still contain molecules of the original material. It can produce good Potencies from 6X and also non conventional potencies, such as D or "Squared" for example. Most people who work with vibrational medicine find at some time it helps to be able to dowse, usually with a pendulum, or to use muscle testing to find out if a remedy helps. If you can dowse with a pendulum ask it, "Does the Voice Potentiser work"? If you cannot please ask someone to dowse the question for you. I ask you to take on trust that this device is all that it is claimed to be, and I am certain you will not be disappointed! Question:I noticed that the device has stopped beeping, what should I do? Answer: It is possible that the batteries have developed a little bit of corrosion or in some other way they have lost contact. The solution is to take the back off the case and move the batteries around a little bit, being careful not to damage them, or to touch any other components. If the batteries are still good, this will solve the problem. If this does not work, you may have to put in another set of batteries, the device uses 2 CR2016 batteries, after removing the old one make sure you load the new batteries positive side up. Guide Price $8,500 - $9,000. Construction difficulty level 7.